The Mountaineering Instructor Scheme provides comprehensive training and assessment for individuals working as instructors in a professional, semi-professional or voluntary capacity, privately or at mountaineering centres. It integrates training and assessment in a variety of testing conditions in mountainous country. This award meets the UIAA model standards for mountain walking and rock climbing leaders. 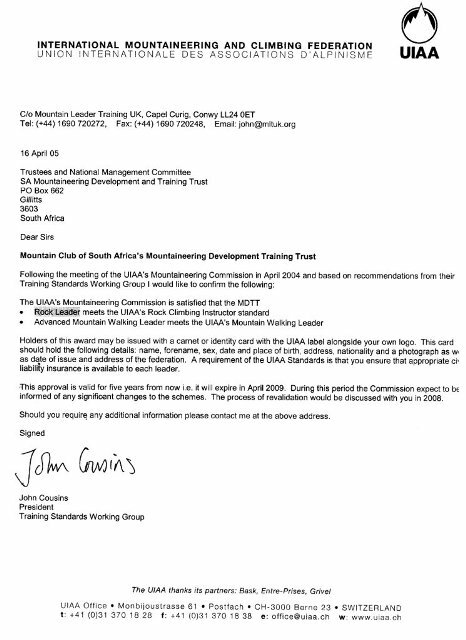 The scheme provides training and assessment in the skills required to teach, and assess general mountaineering, mountain leadership and rock climbing and to lead groups in all mountain areas of South Africa. Completion of a training course alone, without taking and assessment course, is not a qualification in itself, although it may be of considerable benefit to the trainee.